Any shrub used as a hedge in Alberta needs to demonstrate excellent cold hardiness, since average minimum temperatures drop to -25 to -50 degrees Fahrenheit each winter. Planting shrubs in a fertile, moist, but well-draining soil ensures they grow well before their long dormancy. Pruning each spring helps keep plants to a desirable shape and size. With cold winters and fertile soils that often have an alkaline pH, the common and late lilacs (Syringa vulgaris and Syringa villosa, respectively) make twiggy deciduous hedges. 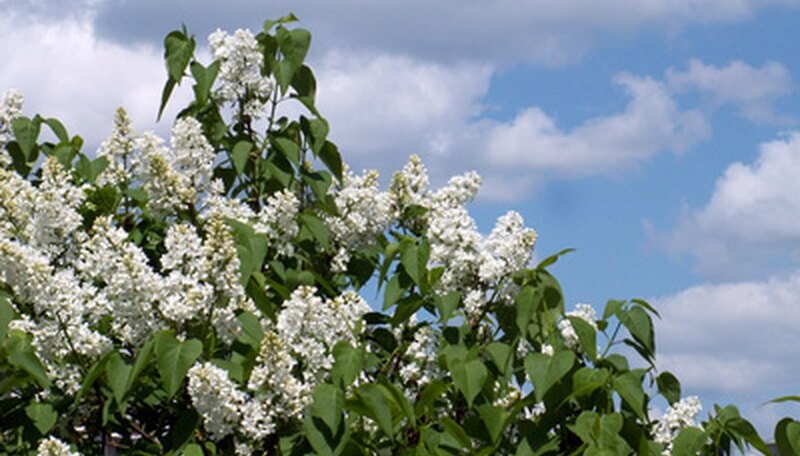 Growing 8 to 12 feet tall and wide, their fragrant flowers in very late spring add beauty to the garden while marking the property line or blocking winds. Tip prune faded flowers to encourage more flowering next spring; lilac shrubs don't look good when harshly sheered into linear forms. Easy to grow and fast-growing, Siberian peashrub becomes a massive, jaggedly mounding deciduous shrub that tolerates heavy clay or dry soils in Alberta. Not overly ornamental, this shrub serves its purpose well as a hedgerow in tough landscape conditions. It grows 15 to 20 feet tall and about 15 feet wide. Especially pretty when blooming in spring, three species of bush cherries may work nicely as hedges, although short-lived or disease-prone in comparison to other suggested plants. Western sandcherry (Prunus besseyi) provides edible fruits in summer and grows well in hot, dry sandy soils that aren't acidic in pH. Try Nanking cherry (Prunus tomentosa) in more fertile ground. For colorful dark foliage, choose the purpleleaf sandcherry (Prunus x cistena), but know after about 10 years the shrub center becomes naked and the shrub rather leggy. Also called shrubby cinquefoil, potentilla shrubs (Potentilla fruticosa) typically grow no taller than 4 feet and tolerate pruning well. Loving alkaline, well-draining soils in full-sun locations, it abundantly produces flowers across summer. Amur honeysuckle (Lonicera maackii) adapts to nearly ever soil type in Alberta, except those that are boggy and wet. The red fruits on this large shrub that grows 15 feet tall and wide are eaten by birds that spread the seeds around, potentially resulting in weedy sprouts across the landscape. If you need a hedge and live near a native woodland, maybe avoid introducing this plant to your area–it is best on the prairie.